A homeowner, Nate, called us yesterday afternoon. After calling three other electrical contractors that had offices closer to him then Sparks, he called us. He had asked if the other electrical contractors did electrical emergencies, they all answered no. What has happened to providing quality electrical service? 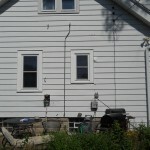 Anyway, he nexted Googled emergency electrical and he found us, Sparks Electric, that provided emergency electrical in West Allis, WI. We provide standard electrical and emergency electrical service and repairs to areas in West Allis, Wauwatosa, Milwaukee, Brookfield, ELm Grobe, Brown Deer, and Mequon, often the same day the customer calls. We add other cities as the job opportunities present themselves. How the call came about, was a very large tree limb with partially dead smaller limps on it, came down during the storms yesterday. We were at Nate’s job 1 hour and 20 minutes after he called. I was the first electrician on the job, Allen made it to the job about an hour later. 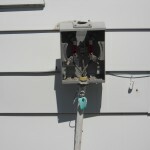 We completed the job that same evening, truly same day emergency electrical repairs. 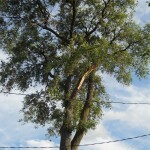 We repaired his down electrical service that the tree limb brought down after it bounced for a few soconds and spitting electrical sparks. 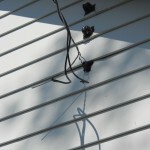 Fortunately, there wasn’t any apparent harm to any of the wiring in the home. 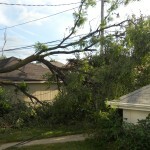 My guesss was the tree is about 70 feet tall, it has one less very large branch left on it. This entry was posted on Tuesday, July 12th, 2011 at 12:11 pm	and is filed under Uncategorized. You can follow any responses to this entry through the RSS 2.0 feed. You can skip to the end and leave a comment. Pinging is currently not allowed.